Mayor Andrew Judd calls himself a recovering racist. He was spat at, ridiculed and threatened when he publicly supported a separate Māori ward in New Plymouth. He gave up his job. So, what next for Andrew Judd? New Plymouth District Council Mayor Andrew Judd has joined the Māori Party. 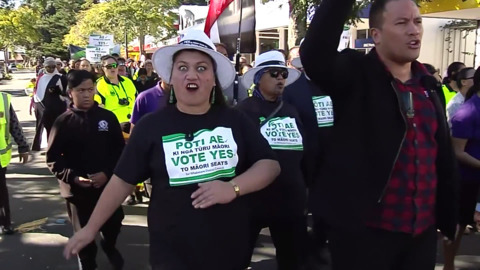 Iwi and hapū of Taranaki took to the streets today in a peaceful protest in opposition to the New Plymouth District Council Waitara Lands Bill. If passed into law, it would mean the council could sell land originally belonging to Taranaki whānau, which whānau say was illegally confiscated by the crown more than a century ago. Today, the council’s goal to evict hermit Eric Brewer from Tapuae was achieved. In a surprise turn around, the New Plymouth District Council has backed down from calls to evict long-time beachcomber Eric Brewer from his beach shack of 16 years.